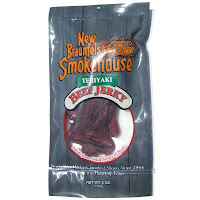 Next in the series on New Braunfels Smokehouse is this Teriyaki Beef Jerky. See my previous reviews of their Peppered Pork Strips, Jalapeno, Sweet & Spicy, and Peppered varieties. The first thing I taste from the surface of these pieces is a light salty flavor, followed by a smoky flavor. Overall, a light surface flavor intensity. The chewing flavor starts with a stronger saltiness, a stronger smokiness, and some natural meat flavors. For being advertised as a Teriyaki variety, I don't taste any teriyaki flavor. I don't really get any sweetness at all, no soy sauce flavor, or anything that resembles teriyaki. Otherwise, this jerky comes off tasting like a plain beef jerky, well smoked, and a fair amount of saltiness. The saltiness seems to be at a moderate level. 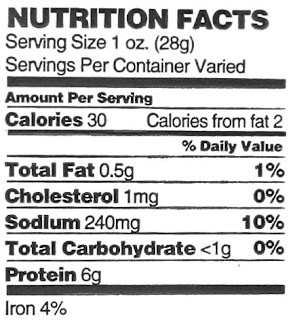 The nutrition facts label shows a lower sodium content, but this jerky tends to become more salty over several pieces. I can taste a bit of the garlic and onion in this. I can see tiny flecks of black on this, suggesting there's black pepper, but I don't taste it. The natural meat flavors are light-to-moderate, having a flavor comparable to a meat stick, or a summer sausage. Overall, it's a pretty simple tasting jerky, very smoky, moderately salty, with a light natural meat flavor. But no teriyaki taste. 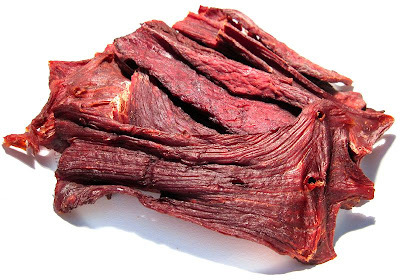 This is a dry jerky, with a lot of flexibility if bent against the grain, but cracking open easily when bent with the grain. Tearing pieces apart with my fingers seems easy enough, while chewing is bit labored but overall easy. The chewing texture starts out feeling stiff, but pliable and some rubbery chewing resistance. With a bit of sucking and light biting it breaks apart slowly. Once it chews down to a soft mass, it has a meaty texture, very fibrous, and steak-like, but more like a dry, well-done steak. These pieces appear to be very lean, I see no bits or steaks of fat. I encountered no tendon, gristle, or stringy sinews. It's also very clean eating, finding no residue on my fingers and no fragments flying off on my lap or desk. New Braunfels Smokehouse sells this Teriyaki variety from its website at a price of $9.50 for a 4oz package. However, I purchased this through their "Jerky Sampler" which gets me six 4oz packages, each a different variety, at a price of $43.95. Add to that shipping costs of $12.95, and it comes to a total of $56.90. That's a per ounce price of $2.37. 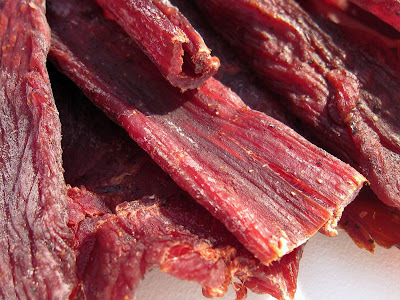 For general jerky snacking purposes, at the $2.37 price per ounce, it provides a fair value. I'm getting an average amount of snackability, it seems to have a satisfactory flavor, a good meat consistency and good chewing texture. The $2.37 price per ounce is considerably higher than the mass-market brands found in the grocery store, but provides only a little bit better snackability. As a Teriyaki variety, at the same $2.37 price per ounce, it's a poor value. I don't taste any teriyaki in this, none whatsoever. And considering it's priced substantially more than the mass-market brands, I think you'll get you more teriyaki flavor from those brands. This Teriyaki variety from New Braunfels Smokehouse just didn't give me any teriyaki flavor, no sweetness, no soy sauce, no nothing resembling teriyaki. But it's not bad for what this jerky is. It still provides a light natural meat flavor, a good deal of smokiness, a fair amount of saltiness, and a touch of garlic & onion. I'm still able to get a decent amount of snackability in terms of flavor. The meat consistency is pretty good for a dry jerky, it's still easy to eat overall, and the chewing texture is very meaty and steak-like. But I couldn't find a reason to consider this above average compared to other average-rated jerky brands I've had. It comes off a little bland. A good beer pairing for this would be an IPA, or fruit flavored lambic.